Edinburgh: Medical staff in Northern Ireland are operating in a “climate of fear”, worried about the threat of imprisonment if they offer advice to women seeking an abortion, the media reported on Tuesday. The number of legal abortions being carried out in Northern Ireland has halved in the past two years because doctors have been so alarmed by punitive draft guidelines, which state that healthcare workers risk life imprisonment for performing an unlawful abortion, The Guardian reported. “There is a real sense of fear, and concern that one of us could end up in prison,” said Carolyn Bailie of the Northern Ireland committee of the Royal College of Obstetricians and Gynaecologists. Doctors are scared to provide information about clinics in England where women could seek an abortion because they are unsure whether giving even this very limited advice is illegal. “It is difficult for us to advise our patients – if you offer them advice on who to contact, are you breaking the law? We don’t know. We are walking a legal tightrope,” said John O’Kelly , chair of the Royal College of GPs in Northern Ireland. Abortion is available if “there is a risk of a real and serious adverse effect on a woman’s long-term physical or mental health”, but there is little clarity about what circumstances this clause embraces. 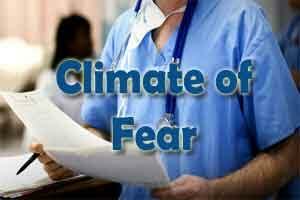 The situation has become more confusing for healthcare staff in the past two years after the publication of draft guidelines by Northern Ireland’s health minister, Edwin Poots, in early 2013. “It is important for practitioners to appreciate that anyone who unlawfully performs a termination of pregnancy is liable to criminal prosecution with a maximum penalty of life imprisonment,” the document stated. In 2012-13, 51 clinical abortions were carried out legally in Northern Ireland, but by 2013-14 (the latest year for which figures are available) the number had more than more than halved to 23.